Located on the North Island of New Zealand, Wellington is the capital of NZ and is positioned on the picturesque foreshore of Wellington Harbour. 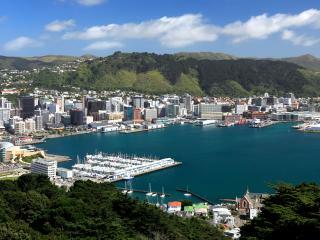 Known as the ‘Windy City’, Wellington is surrounded by scenic mountain ranges and is most famous for some of New Zealand’s most iconic scenery, cultural things to do and national arts. Wellington attractions boast all the excitement of a large city including modern shopping and dining as well as entertainment and nightlife. However there’s much more to Wellington than its CBD, with some excellent cultural, natural and adventure things to do just outside the city including a seal colony and fly by wire. The heritage attractions of Wairarapa are also the perfect complement to the region’s vineyards and wine tasting trails. Shop til you drop at the boutiques of Manners Mall, Lambton Quay and Willis Street. Soak up some culture with an evening at the National Opera, Royal New Zealand Ballet or the New Zealand Symphony Orchestra. Visit the buildings of and drop into the local hangout for politicians, Molesworth Street’s Backbencher Pub and Café. Visit one of the world’s best museums, Te Papa, open daily with free entry (charges apply for virtual reality and motion simulator rides). If you’re feeling brave, you can solo Fly By Wire at 200km per hour a tethered plane at Paekakariki (Kapiti Coast). Visit the most accessible seal colony on the North Island at Cape Palliser or tke a harbour discovery tour. Follow the wine tastings and trails of the Wairarapa region’s 32 vineyards including 26 in Martinborough village. Stroll through a number of stunning gardens in Wairarapa including some with guided tours. Wairarapa is renowned for its heritage attractions and small country museums, so it’s well worth allowing a few hours to explore some of the region’s 8 heritage trails.